Pretzel Logic's Market Charts and Analysis: Why Do Some in the TV Media Still Insist "You Can't Time the Market"? 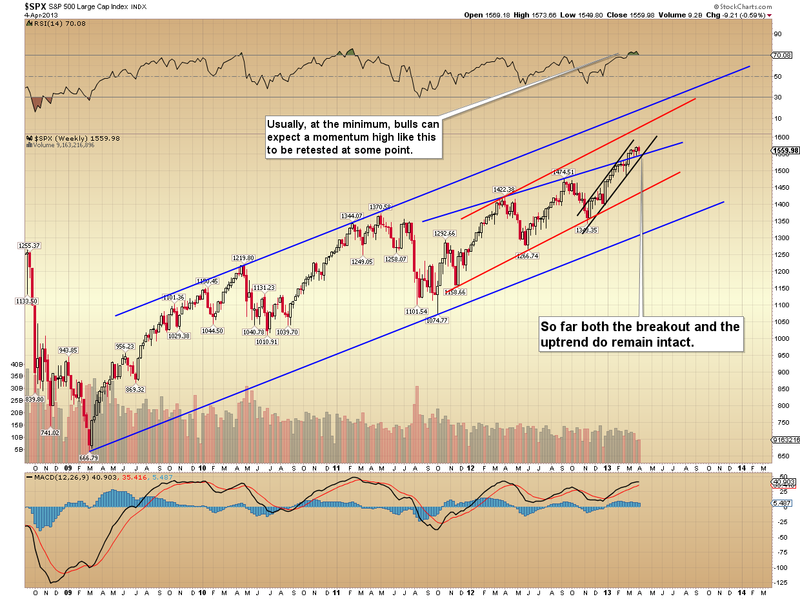 Why Do Some in the TV Media Still Insist "You Can't Time the Market"? It is worth noting that yesterday's action did fulfill the minimum expectations for this pattern, complete with an overthrow of the upper trend line -- so while one more new high would look better, it is not required. I was leaning toward the idea that there could still be one final thrust up still in the cards, but it never came. It's rare that the market follows a projection that tightly, which is why most traders scale in and out of positions, as opposed to trying to time every move to the exact penny. Considering that many of the TV talking heads will tell you that "you can't time the market" at all, I think hitting a turn within a third of a point on a 7-point target zone probably argues otherwise -- especially considering that we hit the two prior turns leading into that within a couple of points as well. Before we get overly excited about the bearish prospects, we do have to recognize the reality that, presently anyway, only the short-term trend is pointed downward. 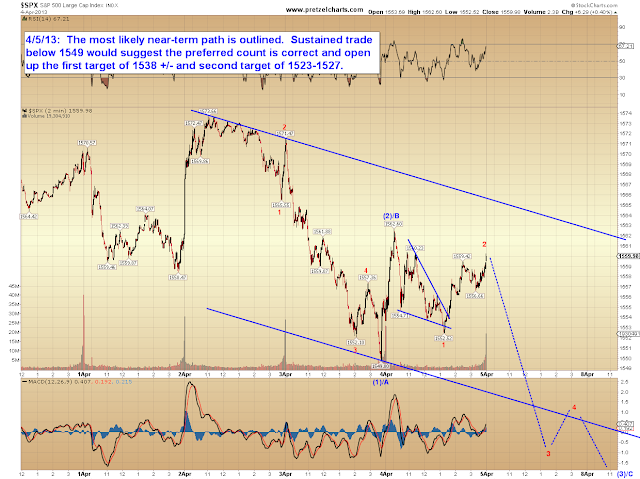 The intermediate and long-term trends are still pointed upwards -- for the moment. The hourly chart notes an intermediate bullish alternate count, which still expects lower prices for the short-term. It also highlights the first target zone, and notes the second target zone in passing. 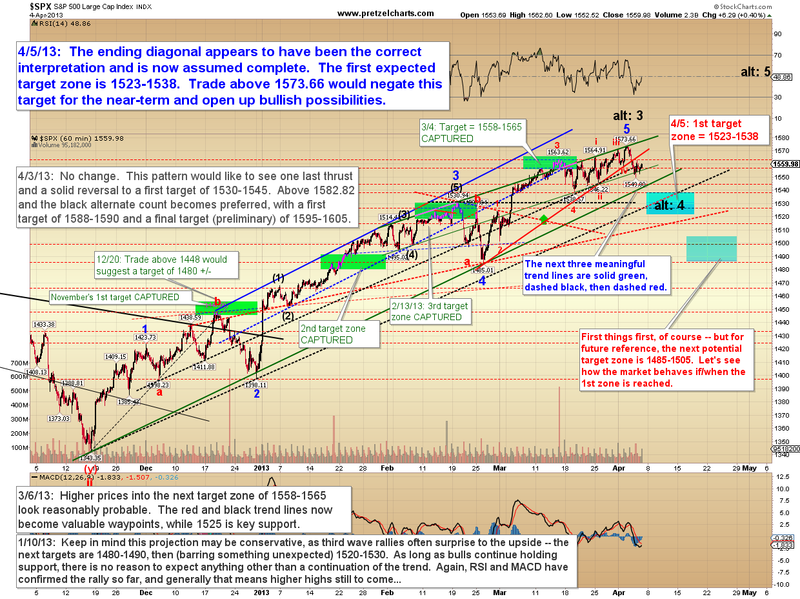 If it becomes appropriate, we'll discuss those options in more detail sometime over the next few updates, after the market reveals a bit more of the near-term wave structure. 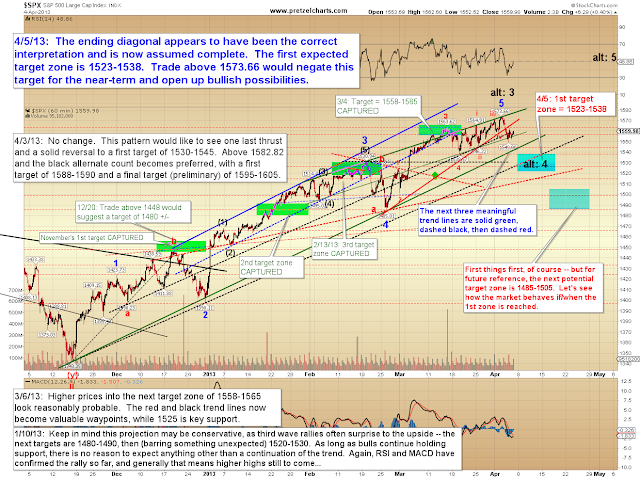 In conclusion, the preferred wave count of an ending diagonal was, in fact, correct and the pattern completed on April 2. 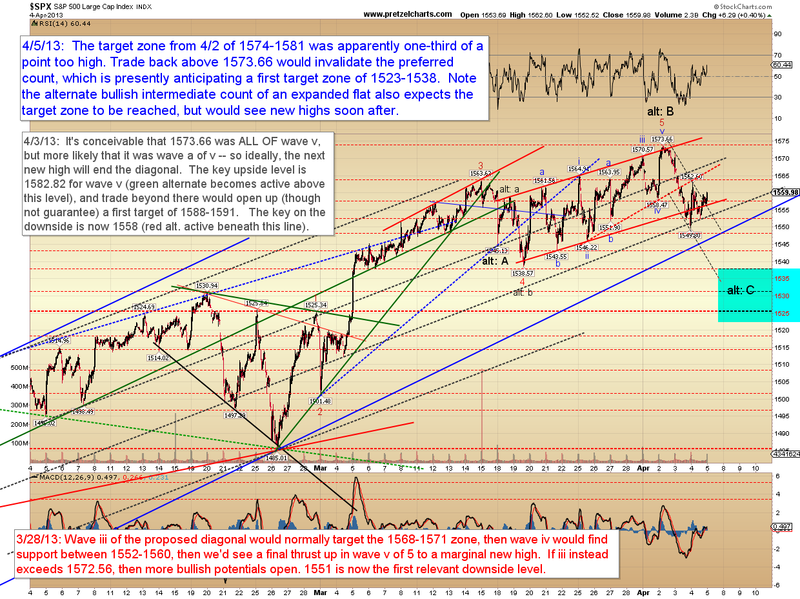 I'm hesitant to get too far ahead of the market just yet, but have outlined the next near-term target zones. In the next update, we'll build from there. Trade safe.